English Country Dance is a form of folk dance first documented in the 16th century. Elizabeth I reportedly enjoyed watching country dance at that time. 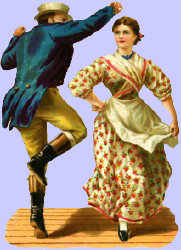 English country dance may have evolved from Italian Renaissance dances or from the dances of the English lower classes. In 1651, John Playford published The English Dancing Master, a compilation of various English country dances. Playford was a music publisher rather than a choreographer, and his manual was revised many times before its final edition in 1728. English country dance flourished in England, Europe, and the United States from the mid-18th century and peaked in the 1820s as evidenced by Jane Austen and other popular novels of the time. In the more fashionable cities English country dancing faded behind French Quadrilles, and ballroom style dances such as the waltz. By the mid-19th century, couple dances had become so popular that the country dances became the realm of country folk rather than the joy of the gentry. Americans kept country dancing alive in the more remote regions of Appalachia (where it evolved into contra dancing) and in the midwest (where it evolved into square dancing). In England, remote villages still held English country dances at celebrations. For nearly 100 years, English country dance was performed only in these isolated areas and nearly disappeared altogether. In the early 20th Century, Cecil Sharp, an ethnomusicologist, began collecting folk songs and dances that still survived in the English villages and American back country, as well as researching the printed material. He started an English Folk Dance and Song Society and encouraged teaching this form of dance in schools. Cecil Sharp came to the United States and started the Country Dance and Song Society in 1915. It's been nearly a century since the revival of English Country Dance in the US. The dances are increasing in popularity and new dances and tunes are continually being composed.